These house cleaning tips are seriously going to save you! If you are a busy mom with kids I’m here to tell you that this tip I’m about the share with you works like a gem every time. Having 5 boys in my home I felt I was cleaning all of the time! With these few house cleaning tips I hope they help you to gain a clean home and find some peace knowing you aren’t living in a disaster. This one tip is my power house game changer! I actually was visiting a friend who just had a baby. She was up cleaning her kitchen when I came and she kept going as we chatted. I told her, “Dang girl! You can come clean my house next!” Bah ha ha! I thought about that for a minute and the more I thought I about it, the more I thought that it was a genius idea! I voiced my thoughts out loud and told her that putting yourself on a timer is a genius idea! I had a good laugh, but still kept thinking about setting a real timer when you clean. The next day I had a 15 minute window before I had to go pick up my boys from a class and my kitchen was a disaster! I set the timer and worked like mad for 15 minutes! Guess what? I totally did it and my kitchen was 87% cleaner than what is used to be. That is a mom win if you ask me! Trust me! Pick one room and set the timer! To help make sure you cover more rooms you can follow this one a day rule. Those of you who have kids, I hope you realize what an awesome resource you have! Utilize these kiddos! I am going to share with you something I have been doing with my kids, but it may sound a little crazy to you at first! Other than cleaning their own room, my kids do not have chores! Yep, you heard me! My kids don’t have chores for a couple reasons. I have a chore chart on my wall that at one point in time we utilized and it seemed to work. This chart had their to do’s and when they accomplished that goal they got to move their magnet to their done side. I’m here to tell you that I dislike chores! Here is why. I don’t like the nagging to get them done, I don’t like the reminding and the dragging out all day long effect a list of chores tends to bring. I don’t like finding out later that they did a terrible job, and I already had let them go out to play. YAY!! MAMA HAPPY DANCE!! No more nagging to get things done, no more wondering if your child will get their “chores” done today, tomorrow or the next. Set them up for success and do it together! When you set the timer, don’t leave the room you are focusing on. If you have an item that doesn’t belong in that specific room, then set it in a basket. When you have 5 minutes left, take that basket and go and disperse those items to where they belong. This will save you time from the running back and forth each time you put something away! You will probably find you have some time left over to go a little bit deeper in your cleaning! Perfect! Keep going! 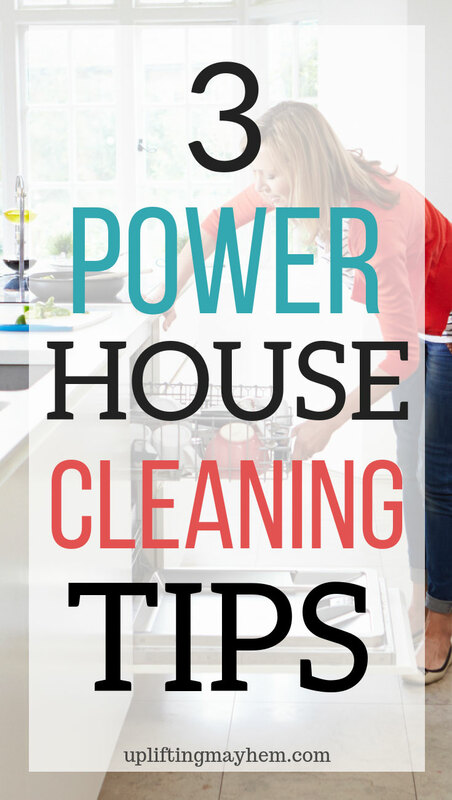 I hope these power house cleaning tips will help you and your family get things clean in your home! I love love it! Let me know how it goes! Here is a video of this tip in action! I cleaned my kitchen when I had a 15 minute window before I had to pick up my boys! For another tip on keeping your house clean and orderly check this out!